“We did great on offense, we could put up a lot of numbers, but we just couldn’t stop people,” he said. Stephenson, now in his second season as Plainville’s head coach, believed the Cardinals could be a state contender. Last December/January, Stephenson started watching and studying the previous season’s games. He drew up new formations and wrote down responsibilities. The result yielded no true base defense. Instead the Cardinals have worked out of three-, four- and five-man fronts depending on the opponents’ offense. As well, Stephenson self-reflected and knew he needed some coaching improvements. He consulted two Hall of Famers, his former coach Shane Cordell at Little River, and past Cardinal coach Larry Friend. “I think I overdid it on their assignments, what I expected them to cover and do and react to,” Stephenson said. The result is an extraordinary one-season turnaround. Plainville has posted an 11-1 season and permitted just 10.08 points per contest. It’s not only the best scoring defense in 2-1A – it’s the top scoring defense in Kansas 11-man football among teams that won at least one playoff game. The Cardinals are slightly ahead of 4A-I finalist Bishop Miege (10.17). Plainville is at state for the third time in school history. The first two occasions came when Larry Friend led the Cardinals to state crowns in ’80 and ’85. His grandson, senior quarterback Hayden Friend, paces Plainville with 1,862 passing yards with 28 scores and eight interceptions. Troy (12-0) has delivered an average score of 44-14 behind a 13-player senior class. The Trojans advanced to their first state game in school annals last year and fell, 30-29, to Phillipsburg. All 13 senior see time, including standouts such as quarterback Reid Greaser, all-purpose threat Cuttar Huss, linemen Wil Smith and Wyatt Huss and wide receiver/end Brody Winder. Jasper, a ’91 Troy graduate, said this year’s senior class is probably the best in school history when all sports are considered. “These 13 seniors after we lost last year by one were determined to get back for another shot, and then put in the time in the weight room and really worked hard in the offseason,” Jasper said. This season, Troy has improved defensively throughout and defeated Colgan, 28-0, last week. The Trojans held the Panthers to negative rushing yards in the second half after Panther quarterback Billy Dickey was injured early in the game. “It’s very hard when you come out preseason No. 1 in a lot of the publications because that puts a target on your back all season, and I think we have gotten everybody’s best shot all season, and we have withstood that,” Jasper said. Five players have exceeded 250 rushing yards, paced by 622 rushing yards and nine scores from senior Alex Martinez. Greaser has thrown for 2,636 yards with 35 scores against seven interceptions with a 67 percent completion rate. Huss has 68 catches for 1,132 yards and 16 receiving scores along with five rushing TDs. Winder has tallied 47 catches for 950 yards and 11 scores. Smith, the defensive leader, leads Troy with 109 tackles and 14 sacks. Senior middle linebacker Kortin Blevins has 98 stops, while Wyatt Huss, an all-state caliber defensive tackle, has 69 tackles with five sacks. Troy is plus-15 in turnover margin. Through the first five games, the Trojans permitted 21 points per contest with a 17-point victory versus eventual one-win Centralia and a three-point win versus Perry-Lecompton, a team that went 4-6. “Everybody kind of got in panic mode around here because you are not going to make a deep playoff run if you can’t stop the run, and we were giving up some big plays, and a lot of rushing yards,” Jasper said. However, the line play and overall defense has significantly improved in the last half of the season. The offensive line brought back just two returning starters. Center Kohlbe King is the team’s lone junior. Huss and Smith start at guard. Senior Jarren Frump was a running back and came to Jasper before the year and told him that he could play line, a choice that really impressed Jasper. Frump has started at right tackle. Sophomore 155-pounder Marcus Martinez was a former JV fullback and has started at left tackle. Jasper likes to throw but Troy has exceeded more than 250 rushing yards in the last three playoff games. “This time of the year, we kind of shift our focus a little bit more to our run game, because I really believe in the playoffs that you have to be able to run the ball, and you have to be able to stop the run,” Jasper said. 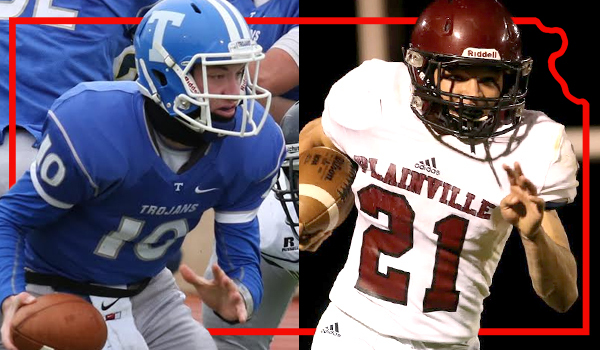 In addition to the defensive adjustments, two key moves the last two summers have helped Plainville improve. In 2014, the Cardinals averaged just 13.7 points per contest under former coach Joe Simon with Ryan Buresh at quarterback. The next summer, Buresh couldn’t throw due to an injury. Stephenson switched Friend from running back to quarterback, a move that immediately worked. Buresh, one of 10 seniors, went to wide receiver and has posted back-to-back great seasons, including 42 catches for 846 yards and 13 TDs this fall. “If I could just teach him to throw the ball well, he could be real dangerous as a quarterback,” Stephenson said of Friend. Before the summer started, some of Nyp’s Plainville friends approached Stephenson and told him Nyp was transferring. Nyp’s family eventually bought a house in Plainville and moved. Nyp has played defensive tackle or outside linebacker, one of multiple Cardinals who changes positions depending on formation. Junior Hayden Gillum paces the Cardinals with 91 tackles, 14.5 for loss. He has played linebacker and defensive tackle. Freshman linebacker Jared Casey has 87 stops. The Cardinals are plus-18 in turnover margin after minus-8 last year. The veteran offensive line returned four starters with senior Jaron Rathbun at right tackle, Gillum at right guard, and junior Nolan Jones at center. Senior Willie Wilkerson is at left guard with Casey at left tackle. The defensive adjustments again helped in the last two playoff games, shutouts versus Republic County and Smith Center. Plainville didn’t prep for Smith Center’s spread look as much as they did for Republic County. However, the improvement with communication and understanding responsibilities helped when the Redmen went spread.